Is your hair dull and lifeless? If so, you are not alone. Many of our clients have hair that has been wrecked and ravaged by daily or weekly blow drying and flat ironing. Fortunately, keratin treatments are bringing vitality back to limp locks. Traditional straighteners and relaxers can break the natural protein bonds within the hair’s structure. In contrast, keratin treatments deliver high concentrations of the proteins (keratin) that are found naturally in the hair, which give it its vibrancy. The keratin concentrations penetrate the hair’s structure from within, resulting in smoother, healthier hair. First, the stylist removes dirt and grime from the surface of the hair with the use of a clarifying shampoo. Conditioner is not applied. Depending on the hair technician and the product used, the hair will either be towel dried, blow dried or allowed to remain damp. The hair is then gathered into sections, and the keratin treatment is applied. Next, the hair is combed throughout, to ensure the product reaches all the hair, from top to bottom. 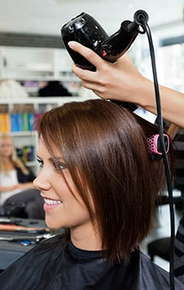 The product is allowed to sit on the hair. The time frame for this step largely depends on the product and manufacturer’s directions, but usually ranges from 10 to 20 minutes. Again, depending on the product, heat may be required, or a cap may be placed on the client’s head, allowing for natural heat to seal in the keratin. Finally, the hair is blow dried and then flat ironed to lock in the product. The intensity of the flat iron, which is heated to at least 450 degrees, also works to add shine and further straighten the hair. Keratin treatments take 90 minutes or more depending on your hair length. Results are temporary, lasting an average of two to three months. The ability to be used on a variety of hair textures, including on African American hair, as well as the ability to be applied to color-treated or previously chemically treated tresses. Though specific instructions may vary, the most important aftercare instruction is that you must not wash your hair for three to four days after the initial keratin treatment. The solution takes time to work, and washing the product out before it is able to bond to your hair completely can undo the effects. Your stylist will provide you with specific aftercare instructions before the end of your appointment. To learn more about keratin treatments or to schedule an appointment, contact us today.